The Kushner Companies officially took over control of the 17 buildings on the LES that Ben Shaoul owned for 3-plus years. For the 2 months that followed the change of ownership, Jared Kushner's company failed to provide basic services like heat, hot water and a locked front door. The tenants filed an HP Action against Kushner and are taking him to Housing Court this week. 1. No Heat/Hot Water: No heat & hot water on a regular basis, even during the coldest weeks of winter when the outside temp was 16F. The culmination of which was a month ago when it was 25F outside and the tenants in the building repeatedly called the building manager and the super, who ignored the requests from Friday evening until Sunday afternoon. Temps inside fell below 45F and the tenants who stayed were sleeping fully clothed with jackets on. In addition to the heat being off completely, the boiler is now on a timer so the heat came on only twice per day leaving the building cold (below the legally mandated inside temperature) and the hot water being lukewarm at best. 2. Malfunctioning Heating System: terrible clanking of the pipes when the heat goes on, which makes sleeping through the night impossible. There were tenants who stayed with friends and relatives b/c even with ear plugs, they couldn’t fall asleep and stay asleep through the night. 3. 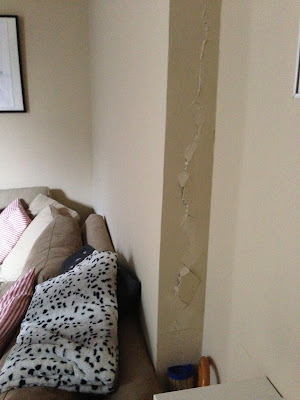 Cracked Walls/Structural Damage: cracks in the walls of apartments on ever floor due to shoddy contractor work in the soon-to-be 7-11 space in the first floor. The company has since fired the contractors and the work has no resumed because of the HP Action. 4. Unlocked Main Entrance: front door electric key system failing randomly with no apparent reason from 1 day to 7 days locking tenants outside or inside of the building and leaving the building unsafe with the front door unlocked at all times. Tenants had to call 911 and have the NYPD come on Tuesday night several weeks back as the front door was wide open and a man was trying to get into apartments at 3:30 AM. 5. Smoke Detector Removal: the contractors disconnected and removed smoke detectors in the hallways as the dust was setting them off saying they had it approved by the FDNY so it’s perfectly legal. 6. Low Water Pressure: extremely low water pressure in faucets and showers throughout the building. 7. Illegal After Hours Work: Contractors working after hours (8 AM on Saturday), blocking hallways, blocking doorways and doing work that created so much dust and debris that DOB ordered that they cover apartment doors to protect residents. 8. Unavailable Super: super has rarely been available to solve maintenance problems (they only hired 1 super for 17 buildings and he doesn’t live in Manhattan), and never available after 4 PM or on the weekends. Emergency contact provided did not work. 9. Filthy Hallways/Entrance: hallways and entrance have not been cleaned on a regular basis in months. The stairwells of the building are disgusting. The residents said that there were discussions of a rent abatement, but that never materialized. Do you know how we can participate in this lawsuit? I am a former tenant of this construction site/apartment building and just moved out in March. Conditions were unlivable and management was useless. If anyone has information on joining this and letting our voice be heard, please let us know. Who are the lawyers? Are they going pro se? If there are volunteer opportunities to help, please let us know. We have had similar experiences at 99 East 7th Street, which is why I'm moving out when my lease ends. Both the super and emergency phone numbers we were giving in October belong to people who have said they no longer work for Westminster Management/Kushner Companies. No replacement numbers were provided, and the landlords are completely unresponsive via email. ...also without hot water and low water pressure it should be impossible for 7/11 to open up if the health dept follows their guidelines but they usually give big corporations like 7/11,subway or McDs breaks, so dont count on that. @Anthony - I think you got it right on a couple of fronts, perhaps most notably the elected officials. Rosie Mendez provided zero leadership on this issue period. When these buildings were first purchase by Westbrook and handed over to Ben Shaoul to manage she held a press conference. That was pretty much it. Residents asked for her help and their requests fell on deaf ears. She and all the others sat idly by as long-time tenants were forced-out. Now she and the rest of the bunch want us to re-elect them. For what? Rosie and her "sister" Margaret Chin voted for both the NYU expansion plan and SPURA. What does this do for us - more students jamming themselves into converted tenement apartments and more uber-rich buying town houses and synagogues for their mansions. How does this help us? Time for a change. They just bought my building (120 East 4th) and took over as of April 9. Already they are shutting off the gas and leaving undated letters under our doors announcing this. Are we entitled small rent adjustments if we can't use our stoves?